Legend has it that the police soon discovered that the recovered motorcycle was missing. It was later discovered at the scene of the accident, and brought back to the station. Suspecting that it had been taken by relatives of the deceased, they emptied the tank of petrol and removed the chain, but once again the vehicle disappeared and showed up at the accident spot. 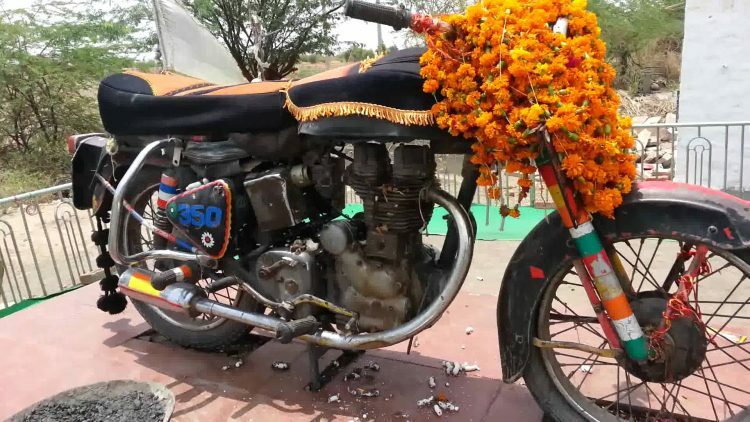 Fearing occult forces, the police returned the bike to Om Singh’s family, who allegedly sold it to a man in Gujarat, but it soon reappeared at the site of the accident, 400 km away. The new owner apparently didn’t want it back after that. 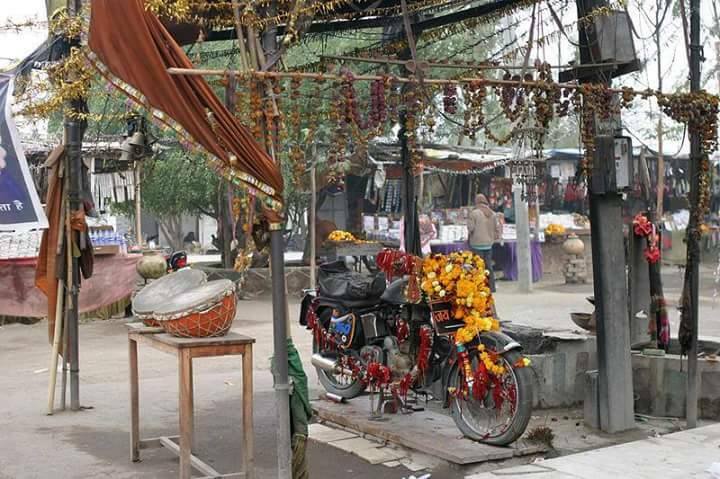 Stories of the disappearing motorcycle spread like wildfire, and many people became convinced that both the Royal Enfield and its deceased rider were deities to be worshiped. 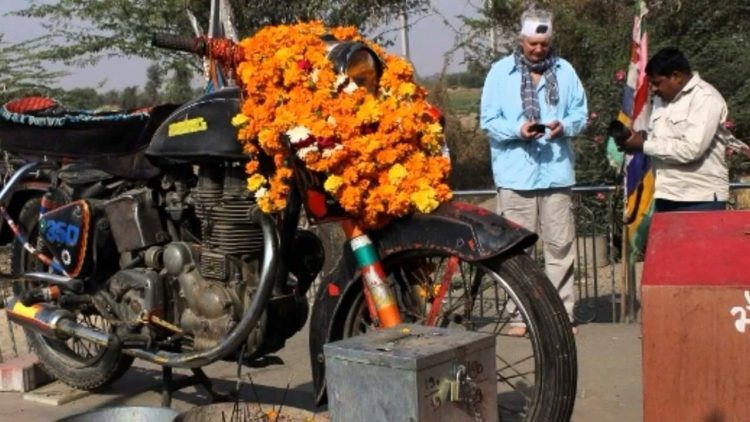 They soon built a small temple at the site of the accident, with a shrine for Om Singh Rathore and a protective glass case for the bike. Nowadays, thousands of people from all over Rajasthan come to the Bullet Baba Temple to worship the unusual deities and ask for various favors. Local taxi and bus drivers, tourists driving on National Highway 65, and relatives of lorry drivers, often stop at the temple to pray for a safe journey. They believe that Om Singh and his Royal Enfield motorcycle will protect them on the road and bring them back home safely, and many swear that since the temple was erected, road accidents on the highway decreased dramatically. The most popular offering at the Bullet Baba temple is alcohol, preferably hard liquor, like whiskey. That’s pretty strange, considering people come hear to ask for road safety, but I guess if it’s not the driver doing the drinking, it’s ok. The motorcycle temple of Rajasthan has become so popular that it now has its own full-time priest in charge of upkeep, performing daily rituals and collecting donations. Across the road, vendors have set up a commercial complex, where visitors can buy all kinds of things, from alcohol offerings, flowers and sacred threads to tie on the wheels of the Royal Enfield, to key-chains and postcards. Legend has it that sometimes, on the date of Om Singh Rathore’s fatal accident, his beloved Royal Enfield motorcycle starts all by itself. It may be just a made-up story, but to the devotees at Bullet Baba temple, it doesn’t matter one bit. “For us, Om Banna is beyond such doubts. Faith has immense power and I believe that he protects all those who drive on this road,” one woman told Live Mint.